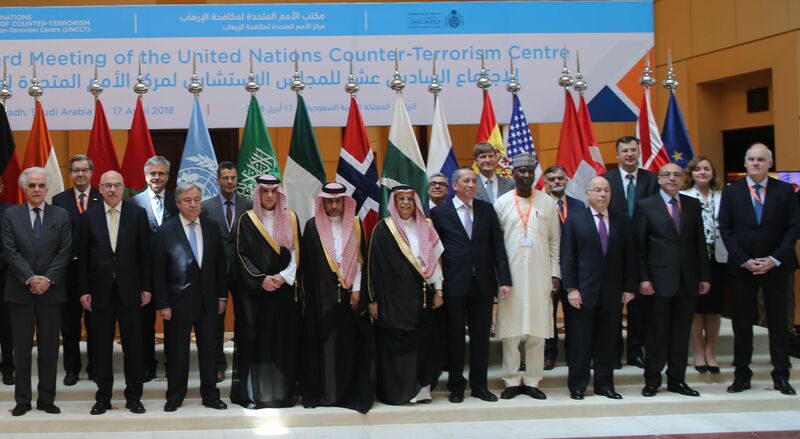 The 16th Advisory Board meeting of the United Nations Counter-Terrorism Centre (UNCCT) took place in Riyadh on 17 April in the presence of the United Nations Secretary-General, Mr. António Guterres and the Foreign Minister of the Kingdom of Saudi Arabia, His Excellency Mr. Adel bin Ahmed Al-Jubeir. The meeting was hosted by the Kingdom of Saudi Arabia and convened by the chairman of the UNCCT Advisory Board, His Excellency Mr. Abdallah Al-Mouallimi, the Permanent Representative of the Kingdom of Saudi Arabia to the United Nations in New York. The objective of the 16th Advisory Board meeting was to review the accomplishments of UNCCT and see how it should continue to best respond to the growing demand of Member States in their efforts to counter terrorism through the delivery of impactful capacity-building projects at the global, regional and national levels, in coordination with other relevant United Nations entities. The Advisory Board Members heard from representatives of Nigeria and Pakistan on their experiences working with the UNCCT and the technical assistance provided by UNCCT to their respective countries. Ms. Natalia Gherman, the Special Representative of the Secretary-General and Head of the United Nations Regional Centre for Preventive Diplomacy for Central Asia (UNRCCA) also spoke. She briefed the Board on how the UNCCT supported the development and implementation of the Central Asia Joint Plan of Action, which is an important regional framework designed to address the threat of terrorism based on the UN Global Counter-Terrorism Strategy and strengthened international partnership. The outcome of this meeting will contribute to the 6th Review of the UN Global Counter-Terrorism Strategy by the General Assembly and to the High-Level Conference of the Heads of Counter-Terrorism Agencies, which the United Nations Secretary-General will convene in June in New York in order to forge a new global counter-terrorism partnership between Member States.